Recover is made even better when you embed it into your website. Prompting your customer's there in addition to email will help you recover even more lost failed charges! You can get your unique embed script on the Billing Form page. During the grace period we float a reminder along the bottom of the page. You can set the duration of the grace period, and also customize the color and copy of the banner. This banner does not prevent customers from using your app. 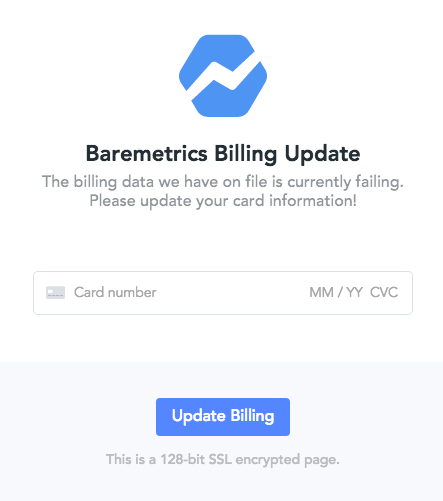 After the grace period is up, your customers are presented with a credit card form and not allowed to use the app until they update their details. This is the same form that you configured earlier. Load the embed script everywhere on your website where you would like it to appear. 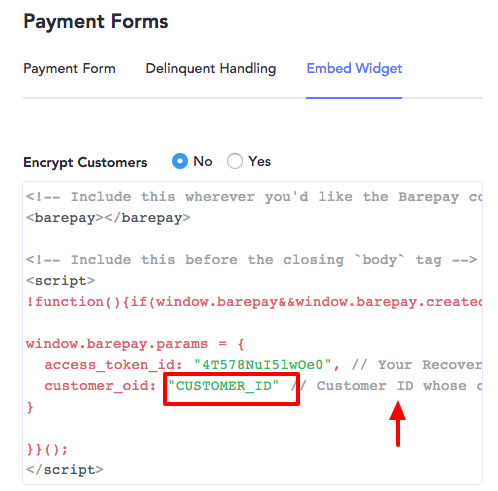 Leave everything as is except for the CUSTOMER_ID, which you should programatically replace with each user's unique customer number given by your payment provider. By enabling this option, you can sign your request data with a secure token only known to your backend and Baremetrics. Once you start sending JWTs, our backend will no longer accept unsigned requests.